Features: Professional Series With Automatic Movement? 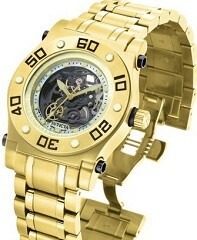 Invicta 4950 Speedway Automatic Skeleton Reserve Collection With 18k Plated Bracelet & Deployant Clasp! Men's 4950 Reserve Collection Speedway Skeleton Mechanical Automatic Watch, sapphire crystal, Swiss automatic movement, 46mm x 57mm with lugs, 18k-ion-gold-plated-stainless-steel case; gray-skeleton dial. Water resistant to 660 feet (200 M) Retail was $4,795...Sell for $650 or Trade!